Despite being from nearby Philly, Bardo Pond don’t make it to New York nearly as often as I would like. Or maybe my version of “often” is too frequent. Either way, the band continue to prove their vitality and consistency into their third decade. This show at Union Pool began with one of their more recent favorites of mine, “Kali Yuga Blues” from Peace on Venus, but spread across the spectrum of the band’s career, from the Lapsed classic “Straw Dog” to several brand-new songs that haven’t made their way onto official releases yet. Of the new ones, it was my first time hearing, “My Eyes Out,” a heavy, relatively fast-burning scorcher of a tune. It’s equally hard to deny the band’s new more exploratory number, “Moment to Moment,” which closed out this show for fourteen mind-bending minutes. If there was any regret about this show, it was that the show’s tight timetable meant that it couldn’t go on longer. Judging by the band’s appearances this year, they are feeling more artistically vital than ever, and ready to prove it. Hope to see them again soon. I recorded this set with a soundboard feed from Union Pool engineer Robert (which fades in after about 50 seconds), together with Schoeps MK4V microphones. The only other flaw in the sound is the hiss of the smoke machine, but it’s less a true flaw than “atmospherics.” Overall, the sound is excellent. Enjoy! Man, I love this band. 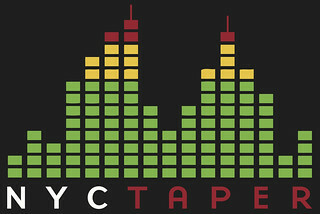 Another fantastic recording from the nyctaper team, thank you. New material sounding great.